“Pattern” SDJ – Out Now! 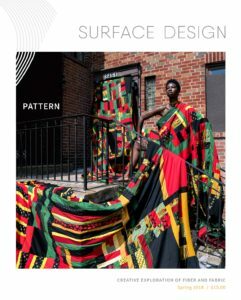 Surface Design Association is excited to announce “Color”, our Spring 2018 edition of Surface Design Journal! This Journal features the significant role pattern plays in our physical world–from natural to synthetic, visual to linguistic, and everything in-between. 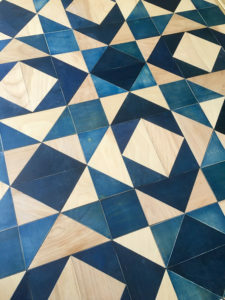 Pattern is an integral part of the building blocks that form our lives. 1) “Unlearning to Quilt” by Mallory Nezam spotlights the contemporary quilter Basil Kincaid and his evolution from the human form as subject matter to more abstract shapes, serving as wall hangings and sculptures. Basil Kincaid InnaSpace Travel 2017, 24′′ x 36′′. 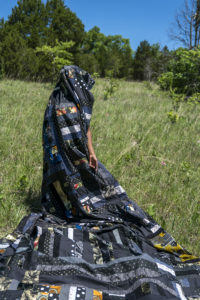 2) “Why A Glossary?” by Aaron McIntosh considers the pressing issues for the next generation of fiber and textile artists by decentralizing the common dialogue. 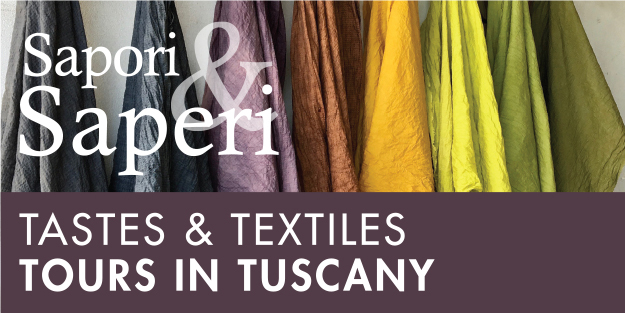 Using key context words pulled from a hat to generate conversation from past iterations, this article covers issues of diversity, equity, and inclusion within fibers and textiles. 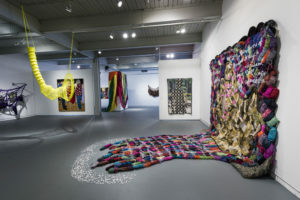 Queer Threads exhibition (installation view) curated by John Chaich at the Maryland Institute College of Art (MICA) 2016, with the Leslie-Lohman Museum of Gay and Lesbian Art. Artists le to right: Sheila Pepe, James Gobel, Jesse Harrod, Larry Krone, Liz Collins, Harmony Hammond, Aaron McIntosh, LJ Roberts. Photo: Dan Meyers, courtesy of MICA. 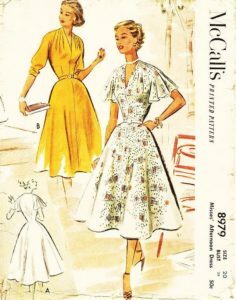 3) “Pattern Making: The Digital And The Analogue” by Elisalex de Castro Peake takes us through the timeline of when sewing patterns for the home sewer first came about, their rise and gradual decline in popularity, and the sudden resurgence in home sewing and the inevitable new wave of sewing pattern companies that followed. 4) “Cosmology in Repeat” by Robert Mertens looks at pattern’s loss ability to carry meaning due to pop culture and commodification, and his entry points into rediscovering that meaning. Surabhi Ghosh Draupadi Draped and Squaring Circles 2017, upholstery vinyl, pins, hand cutting, dimensions variable. 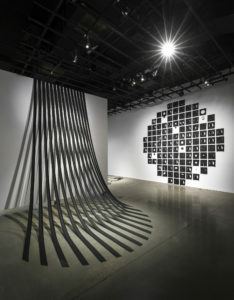 Photo: Guy L’Heureux, FOFA Gallery, Montreal. 5) Informed Source: “The Patterns of our Lives” by Judy Newland examines the patterns that surround us and what defines a pattern. The article features five veins of exploration into patter: science, history, culture, technique, and storytelling. Kelsey Wiskirchen 2016, indigo-dyed plywood, detail from studio work table. 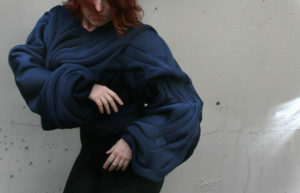 6) “Emerging Voices” features the work of Kath Forgan, who creates sewing patterns using an intuitive ignorance, to make topographical organic garments highlighting and distorting certain elements of the figure. Kath Forgan Unknown Flow: Sweater 2017, neoprene, ribbing, cotton thread, pattern dra ing, sewing machining, hand stitching, 36′′ x 24′′ x 8′′. Model: Kath Forgan. Photo: Nathan Rice. 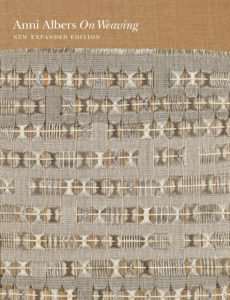 7) Janis Jefferies reviews “Anni Albers: On Weaving” in our “In Print” department. In it, Jefferies examines Albers’ keen understanding of complex ideas, influences, and patterns of communication. Anni Albers “On Weaving” book. 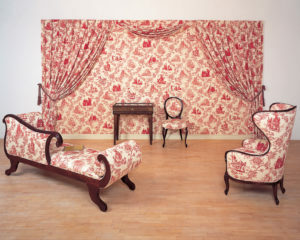 Renée Green Mise-en-Sc ne: Commemorative Toile 1992, pigment, cotton sateen upholstered furniture, paper-backed cotton sateen wallpaper. Collection of The Fabric Workshop and Museum. Photo: Will Brown. 9) “In Review” Dali and Schiaparelli: In Daring Fashion reviewed by Maggie Duffy examines the long-time collaboration and professional relationship between Elsa Schiaparelli and Salvador Dalí and how their aesthetics combined into iconic works. 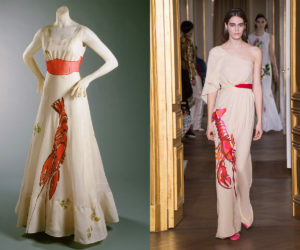 Elsa Schiaparelli Woman’s Dinner Dress (left) and Haute Couture Spring/Summer 2017 (right). 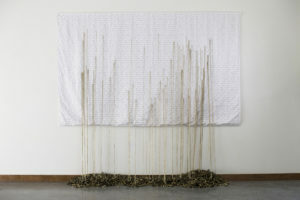 10) “Spotlight on Education” George Fox University by Breanne Sherwood looks back at when Brooks Harris Stevens visited campus to show pieces from her series, Mending Gold: With Reverence. Brooks Harris Stevens Mending Gold: When Will It Be Enough? 2017, hand-stitched quilt, gold thread, single red brass bullet casing. Photo: Stephanie Peterson. Isabel Berglund and Elizabeth Kozlowski at the opening of Home Mask Relations, Florida Atlantic University Galleries, 2017. To buy a copy of “Pattern”, go to the SDA Marketplace, or you can check out a free digital sample on our SDA Journal page.